INN TV meets with Gita Boaron, who claims that she is the cousin of Libyan leader Muammar Qaddafi. There have been rumors in the past about Libyan leader Moammar Qaddafi's Jewish roots, and now it seems to be confirmed. 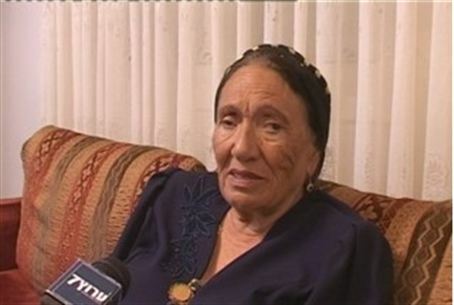 Israel National News TV met with Gita Boaron, who claims that the Libyan dictator is indeed Jewish and that she is a distant cousin. Boaron, who heard the story about Qaddafi's Jewish roots from her mother as she was growing up, said that her family has never even considered getting closer to Qaddafi, since "There’s no place like Israel," as she put it. She noted that it is only recently that Qaddafi has really become anti-Jewish. Boaron noted the historically good connections that Qaddafi had with the Jewish people. "They say he had connections with the Jews. His son is going to marry a Jewish woman, maybe he already married her. It was in the media, that his son married a Jewish woman from Italy or France." She described the current situation in the Arab world as "chaos. One eats the other. May they eat one another and not us."